List of games I played at BGG.CON 2013 superimposed on the list of games I was planning or wanting to play. I rearranged the list so that it is in order of when I played the games, and I added games that I played that weren't on the planning list. Games that I didn't play, but planned to, follow the played games on the list. I appreciate comments. 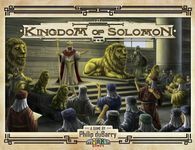 Other than Kingdom of Solomon, Ticket to Ride and Keyflower, I have not played any of these games. This will be was my first CON. 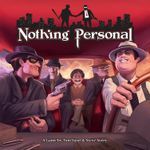 I have read Tips on BGG.con from a Veteran (updated for 2010). I subscribed to the CON forum months ago, and I read many of the posts to the forum. I think I may be putting more games on this list than I can play at the CON. But they all look so fun. It turned out that I didn't play most of the games on my planning list, but I had a great time at the CON! Any other thoughts or game recommendations are welcome. Thanks for looking at my list. thanking him for his recommendation (below) of this and explaining that the game description talked about managing your park and how I got my fill of managing things at work. had this checked out from the library and invited us to play it. We did, and we enjoyed it. I don't remember who won, but as I recall David, Chris and I weren't too far apart in the scoring. We took the top three places. I was second or third. Thanks Tyler for the recommendation. It was spot on. I guess I need to listen more. After finishing and helping to put away the game, my wife and I ate supper and went to the first timers' meet up. 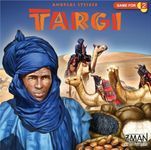 Another game I saw on Virtual Flea Market for Delivery to BGG.Con 2013. This looks like a fun little filler game. After the first timers' meet up, I had about 45 minutes until my first scheduled game (below). I checked this out of the library and got in a couple of games. I enjoyed it, and it's on my wishlist. I brought an early end to the first game by building a six floor high rise which propelled me to the win. I don't remember who won the second game. After the CON I discovered that we probably played the game incorrectly. I have yet to find a copy of the rules online, but one of the how to play videos and some comments indicate that I likely misread the rules. We were rolling too many dice which made the play much easier than intended. Oh well, I plan to purchase the game if I don't receive it as a gift. I've signed up on the BGG.Con 2013 - Wargames, Meetups, and Mules GeekList to play a warm up of this Wednesday at 8 p.m. It looks like a fun and fast wargame. I played this as scheduled (four players) and enjoyed it. It's on my wishlist. played as the American Continental Army. played as the British Army, and I played as the Loyalists. Steve and I got off to an early lead by grabbing New Hampshire and Maine. New Jersey and Delaware changed hands a few times. Steve played the Hessian reinforcements card, placed a huge army in Halifax and transported most of it by sea to Charles Town. While Steve and I were conquering South Carolina and Georgia, George and Gerry took Massachusetts, New Hampshire and Maine. They also invaded Nova Scotia and New Jersey to deny us control of these. That put them ahead, and they both played their truce cards to end the game with a decisive victory for the Americans. I requested to participate in the Thursday morning session on BGG.Con 2013 - Wargames, Meetups, and Mules. I played this as scheduled. It was a seven player scenario. I enjoyed the game and the interaction with the other players. Character "Q" was given a full 5 part turn to get things going before any of the rest of us were allowed start. He shot character "I" in the leg and started running for the office next to the newspaper. Character "D" advanced. Characters "G", "R", "C" and "D" shot and advanced while character "I" hobbled toward the doctor, the buff colored character "D" in the waiting room on board "HH". Character "D" shot and missed. After a couple of turns, Character "D" was shot and critically wounded near where character "C" started. He lay dying in the middle of the street. Character "C" made it into the office, but when he looked out the window, he was shot and killed which sealed the victory for the orange/pink team. Afterward, I went to the virtual flea market meet up to pay for and receive the games I promised to purchase. I then went to lunch with my wife. I'd like to participate in the TTR tournament. I learned an important lesson about signing up for special events. If space is limited, be at the the place for the sign up list when it is supposed to be posted. I was taking my luggage up to my hotel room when the list was posted on Wednesday. I arrived at the sign up sheet about 45 minutes later, and all the regular and wait list spaces had been taken. I put my name in the margin below the wait list, and figured I missed my opportunity. I learned another lesson; don't give up too soon. I went to the event room and waited with the wait list people. Several who signed up did not come on time. They started seating people from the wait list. I was the next to last person to be admitted. 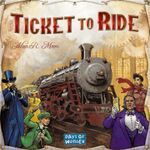 In the qualifying round I played two games of this, coming in third place out of four players both times, and one of Ticket to Ride: Europe, coming in second out of four players. I did not do well enough to advance. I had fun and received the prize given to all participants. This took the rest of the afternoon. I looked around the exhibitor hall, gathering a couple of stickers for my exhibitor bingo card, and then joined my wife for a picnic style supper in our hotel room. I've signed up on the BGG.Con 2013 - Wargames, Meetups, and Mules GeekList to play this game. Currently it is scheduled for Thursday at 7 p.m. I played this as scheduled. There were eight players in addition to two instructors/referees. It was fun with plenty of good player interaction. hosted this. They moved several tables together and spread out a vinyl mat with a countryside view. and I joined two others on the Axis team, and we faced off against four Allied fliers. Andy and I each flew a FW-190. Our team also included a Zero. The Allies flew Mustangs and a Spitfire. I think I was the first casualty. It wasn't long before a couple more Axis planes went down. I was brought back into the game pointed away from the action and into a cloud. By the time I got turned around and close to the fight we lost our fifth plane to the Allies, and the game was called in their favor. I did not plan to play this. My wife checked this out of the library along with a copy of the base game. Since I hadn't played a game with my wife that day, I decided to join her for this. We played with one other player, and enjoyed it. It's on my wife's wishlist. I've signed up on the BGG.Con 2013 - Wargames, Meetups, and Mules GeekList to play this game. Currently it is scheduled for Friday at 9 a.m. I played this as scheduled. We did get a fourth player. I enjoyed it. It's not on my wishlist yet only because I have yet to discover/join/start a group of wargamers in my local area. brought the game and commanded the southern front for the Polish side. Chris commanded the northern front of the Polish side. commanded the southern front for the Soviets, and I had the northern front for the Soviets. At the beginning of the game the Polish side played event cards that gave them the initiative and extra orders which gave them a real boost. Although the Soviets pushed the Poles back on both fronts, it was obvious that the Soviets would be well short of the victory conditions. We were playing on a Geek Chic table, and the game was running longer than we thought it would because we were all new to the game. We needed to make room for the next group that had reserved the table so we declared that the Polish side won. The Geek Chic tables were very nice and enhanced the game experience each time I played on one. I saw this on the Rahdo Runs Through►►► The 2013 Games of Interest GeekList. 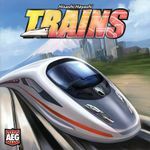 It's item 35: Item for Geeklist "Rahdo Runs Through►►► The 2013 Games of Interest" . I think I would really enjoy this game, but my wife would not care for it. It looks like a strategic puzzle style game like Twixt or Cathedral. After lunch while I was in the exhibitor hall, I played a game of this at the Steve Jackson Games booth. I enjoyed it, and it's on my wishlist. I've signed up on the BGG.Con 2013 - Wargames, Meetups, and Mules GeekList to play this game. Currently it is scheduled for Friday at 3 p.m. I played this as scheduled. It was a six player game, two teams of three. I enjoyed it. commanded the left flank of the brown block side. commanded the right flank of the gray block side. I commanded the left flank of the gray block side. The flanks saw the vast majority of the action. The center was almost completely quiet. The really heavy fighting was on brown left/gray right. The gray side of that flank took significant losses, but the brown side was nearly wiped out. On the other flank losses were more balanced, but I think gray ended with a slight edge. 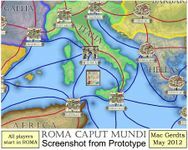 Gray won the overall battle with fifteen banners. Nine were won by the right flank commander who was voted the most valuable player and awarded a prize C&C Ancients Expansion by Steve Duke on behalf of GMT Games. I was glad to play under the leadership of Geoff. He helped me understand how to use the various units and avoid some newbie mistakes. I bought a copy of the base game in the virtual flea market and I'm looking forward to playing it here at home. I'll be demonstrating this game for Minion Games. I really like the theme. I recently received the copy I will bring to the CON. I've played it a few times with my wife. We are enjoying it. We are both new to the worker placement mechanic. So far she beat me in the first game, but I won big in the second. Let me know if you would like to try it out. I'll be glad to schedule a game with you. I demonstrated the game to four other people in two separate games Friday evening in the Enterprise ballroom. In each of the games my wife and I played with two of the four. They came in two groups. It was fun. This is on my short list for a tactical wargame, and I'd like to play it a time or two before committing to buying it. for bringing this game just so I could try it out. Our schedules didn't mesh well, but he loaned the game to me so I could play it. I did get a game in Saturday afternoon after shopping in the flea market and finally getting a blackout on my exhibitor bingo card. I grabbed a table in the Enterprise ballroom, and put up a players wanted flag. Eric joined me for scenario 1. He hadn't played the game before so we read through the rules and stumbled through the game. At my suggestion Eric played as the Americans, and I played as the Germans. As stated in one of my comments below, I got waxed. By the end of turn three Eric eliminated two of my four squads and had no problem meeting his victory conditions. The game mechanics seemed good, but the scenario felt unbalanced due to strong units on one side (the Americans) and weak ones on the other (the Germans). I remember reading a similar comment by someone else on the game. I'm probably going to pass on buying it for now. Although I did not put this on my planning list, I was thinking about it. I played this Saturday evening right after the main raffle for prizes. There were six players in addition to two instructors/referees. It was fun with plenty of good player interaction. who were the instructors and referees. The engagement was two British frigates and one British ship of the line versus two French frigates and one French ship of the line. I don't remember if we established compass directions for the play area, but I will make up and use such to facilitate my description of the game. The French started at the northwest corner heading east by south single file with the ship of the line following the frigates. The British started at the southwest corner heading east by north single file with the ship of the line following the frigates. The wind was blowing from the west to the east. I commanded the lead French frigate. I bore hard starboard (right) for two turns trying to get upwind of the enemy, and found myself in irons (headed into the wind) on the third turn. Unfortunately for my fleet this caused a bit of a traffic jam. Another consequence of my maneuver was that I became the first target and a few turns later the first casualty. By a couple of turns later all the frigates for both sides had either been sunk, struck colors or fled the playing area. Another game beckoned so I left to play it before the duel between the ships of the line concluded. I enjoyed the game, and will play again if invited. The use of movement cards like Wings of Glory: WW2 Rules and Accessories Pack is a good way to accomplish simultaneous movement orders without paperwork. It felt like the mismatch of ship and ship base size to the scale of gun range led to an overly crowded play area. The ship status boards were nice. It was easy to assess and record damage as well as keep track gun status (loading or ready to fire). Drawing damage chits was easier than rolling dice and consulting combat/fire results tables. I did not plan to play this. Wattsalpoag Games was on my exhibitor bingo card. When I stopped by the booth to find out about their games and get a sticker, I saw this game displayed and asked about it. The description sounded very interesting. I checked it out of the library. and Seth joined my wife and me for the game. It was close and exciting. Marshall triggered the end of the game. Marshall and I both scored 35 points, but he won the tie breaker in that he finished with more cash. My wife scored 34 points, and Seth was not far behind her. Marshall, Seth and my wife all completed their final flight route. Even though I didn't, I managed to complete enough long routes to tie Marshall in points. 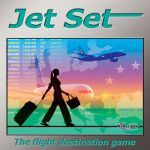 I really enjoyed the game and put it on my wishlist along with the expansion Jet Set: Distant Lands – Expansion Set 1. I saw this on Rahdo Runs Through►►► The 2013 Games of Interest. It's item 198. It looks like both Richard Ham and Tom Vasel really like it. I need to give it a try. It looks to have lots of potential for fan expansions. I didn't get a play of this in at the CON, but my wife did. She liked it so I put it on my wishlist. One of my GeekBuddies told me about this game. It looks like fun. I'm always on the look out for fun games that play well with two and my wife might like. I didn't get a play of this in at the CON, but I will have opportunities here at home. I saw this on the Rahdo Runs Through►►► The 2013 Games of Interest. It's item 53. Games based on a Biblical theme are highly interesting to me so I want to check it out. There's not much on the Geek page for it. I didn't get a play of this in, and I don't know if it even made it to the CON. I participated in the contest about this game. It looks like a fun game I would enjoy. I didn't get a play of this in at the CON, but I met Tom Vasel, and I saw the game at the Game Salute booth. I saw this on the Rahdo Runs Through►►► The 2013 Games of Interest GeekList. It's item 15: Item for Geeklist "Rahdo Runs Through►►► The 2013 Games of Interest"
I didn't get a play of this in at the CON. This game looks like a blast! One of my Geek Buddies told me it is a lot of fun. I saw this on Rahdo Runs Through►►► The 2013 Games of Interest. It's item 25. I've replied to the Pitchcar Tournament thread on the BGG.CON forum that I would like to participate in the tournament. Interest/Commitment: High Not happening for me this year. I didn't get a play of this in at the CON, but I saw a track set up in the dexterity games area. 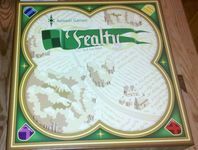 I saw an earlier version offered for sale on the Virtual Flea Market for Delivery to BGG.Con 2013 and checked it out. It looks like a pretty good game. I'd like to play it before acquiring a copy. I wonder how it plays with two. It looks like something my wife and I could have lots of fun with. I really want to try it out. It looks there are currently three copies of it in the library. I played the game with a geek buddy and enjoyed it so my urgency of playing it at the con is much lower now. I didn't play this at the CON. 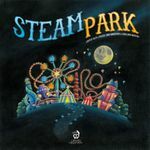 Another game for sale in Virtual Flea Market for Delivery to BGG.Con 2013. It looks interesting.